A Big THANK YOU to everyone who entered our Lauren's Hope giveaway in honor of World Diabetes Day! And a BIG THANK YOU to Lauren's Hope for honoring Diabetes Awareness Month! 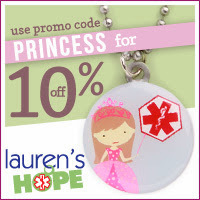 One lucky winner will get $50 to spend at Lauren's Hope! The possibilities are endless! The hardest part will be tying to decide what to buy! And the winner is.... Kelly M! Kelly - Please get in touch with me to claim your prize! If you didn't win, don't forget that you can get 10% off your purchase by using the word PRINCESS! So there's still a chance to get some special BLING! There are lots of items that would make wonderful stocking stuffers! And just think... no lines! No middle of the night shopping! No stress!